Pole barns are very common and we offer a variety of them, suitable for all types of uses. D Cross Barn Co is a leading pole barn builder in Oklahoma and the surrounding states. For many years, D Cross Barn Co has been constructing sturdy Pole Barn buildings, with hundreds of pole barns being erected serving a multitude of needs, from storing farming equipment, to residential garages and shops. You can get started on your pole barn project today. Click here to request a pole barn quote. Tempted to buy an inexpensive DIY barn kit, or a standard set of Pole Barn plans? While they may seem like a good option because they are so cheap, but without professional construction experience and specialized equipment, they are not a good idea. When in doubt talk to the pros at D Cross Barn Co. first – we have decades of experience in constructing beautiful Oklahoma pole barns. 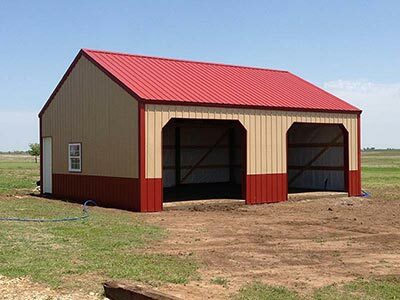 With a little bit of planning we can build you exactly the pole barn you are looking for and eliminate nearly all of the headaches. When you want a high quality metal pole barn worthy of what you’re storing and is visually appealing for your property, contact D Cross Barn Co.